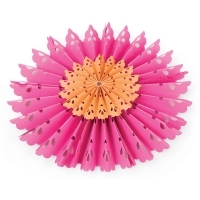 Easily create eye-catching party décor with Sizzix Thinlits Party Fan Dies by Katelyn Lizardi. Wafer-thin, chemical-etched Thinlits dies are designed to cut, emboss, or stencil a variety of materials. Use them on cardstock, paper, metallic foil, and more. 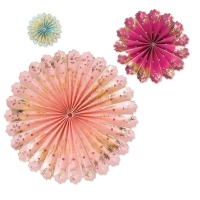 The finished fans make a fun custom backdrop for photos, or string them into a garland. The large fan is 11"Dia. The medium fan is 6-1/2"Dia. The small fan is 3"Dia. Sizzix Dies include a manufacturer's three-year limited warranty. ® Sizzix is a registered trademark.™ Thinlits is a trademark. Easily create eye-catching party décor with Sizzix Thinlits Party Fan Dies by Katelyn Lizardi. Wafer-thin, chemical-etched Thinlits dies are designed to cut, emboss, or stencil a variety of materials. Use them on cardstock, paper, metallic foil, and more.